My great-great-great-grandfather, Elijah Dickinson, enlisted in Union Army in 1862. He was joined by both of his brothers, Atwood and James, as well as their sister’s husband, Nelson Cohaskey. The four of them served in Vermont’s 6th Infantry. Elijah died of disease during the war and is buried in Washington, D.C. Nelson also died while serving and is buried in Annapolis, Maryland. Atwood survived the war, moved from Vermont to Iowa, and is buried there. I didn’t have too much trouble locating the final resting places for the three of them, but I had some difficulty locating James, the youngest brother. I found that he did have a pension record, but it wasn’t available online, so I headed down to the National Archives, which is fortunately just a subway ride away from my home in Maryland. All indications in the pension file were that James lived in Cambridge, Massachusetts, with his wife and daughter. The file even contains a letter from the undertaker who buried James. The letter states that the undertaker lived in East Cambridge and that “my return of his death to the City Hall Boston reads James Dickerson which is a mistake, his correct name being James M. Dickinson.” Not only did this affidavit confirm my hunch that James must be interred somewhere in Cambridge, but it led me to his death certificate, which was indexed under Dickerson instead of Dickinson. Unfortunately the death record did not state the place of interment. So I started randomly calling cemeteries in Cambridge, a method which has worked well for me in the past. No Cambridge cemetery had James, but a woman at one cemetery said, “You should call Holy Cross Cemetery in Malden. A lot of Catholics from Cambridge were buried there.” It couldn’t hurt, right? So I called Holy Cross, and sure enough he and his wife were buried there, but there was no headstone on their plot. Plenty of my relatives who are buried in and around Boston do not have headstones, but James is the first one I found who was a veteran. So I decided to apply to the Department of Veterans Affairs (VA) for a government-issued headstone. The application itself is online, but submitting it requires proof of service as well as assistance from the cemetery. In October 2015 I completed the application, attached proof of service from the pension file, and sent it off to the cemetery, which also required a $100 setting fee for veteran markers. My contact there was tremendously helpful and she submitted the completed application to the VA with an authorized signature from the cemetery. In early December I got a letter from the Veterans Administration stating that they needed documentation confirming that James was buried at Holy Cross, but would not accept contemporary burial records. They wanted copies of the original records from 1888. Knowing that these aren’t always available, I sent an email to my contact at the cemetery and held my breath. They were able to scan and email to the VA handwritten records from a Burial Book from the late 1800s. Phew! Two weeks later I got word that my application was complete and that the marker would arrive at the cemetery in 4-6 weeks, which would be late January 2016. Because the cemetery would not install the marker during winter, they assured me it would be installed by Memorial Day. I had only two minor disappointments along the way. 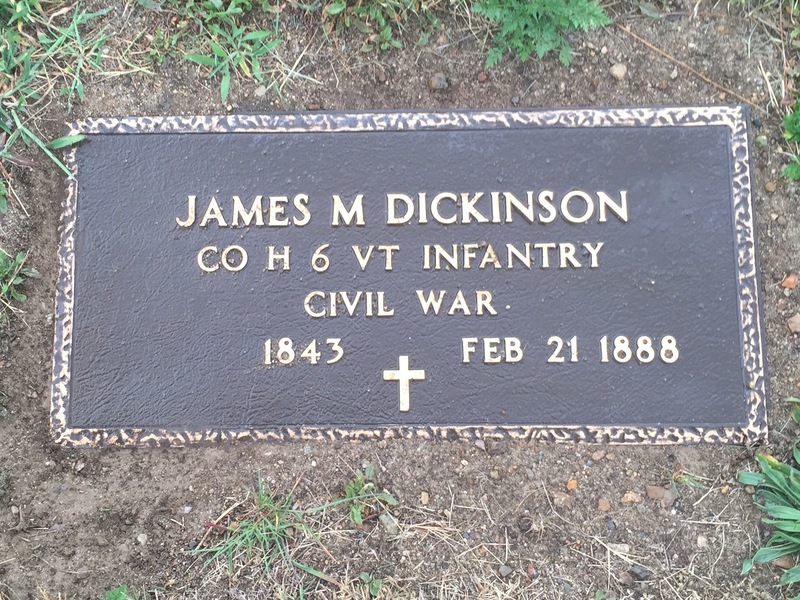 First, VA policy prevented me from having the name of James’ wife, Annie (Needham) Dickinson, added to the marker. Second, this particular cemetery requires all veteran headstones to be the flat markers, so I was not able to get one of the special Civil War-era upright markers that are available. It would be another couple of months before I could travel up to Malden to see the installed marker for myself. The entire process from application to installation took about seven months, and I could not be more pleased with the assistance I received from my contacts at both the cemetery and the Department of Veterans Affairs. 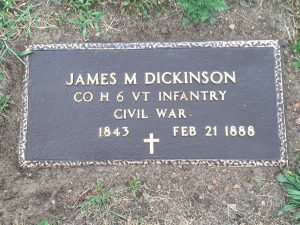 And now all four members of the Dickinson family who served together in the Civil War are resting in properly marked graves. 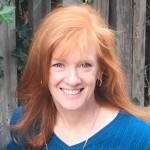 Oh Patty – I am so happy for you – I am battling this very same genealogical and family history issue right now. My great great grandfather John E. Lee was a member of Michigan’s “Fighting Fifth” during the Civil War. He was was awarded a Kearny Cross for his service at Chancellorsville, was wounded at Gettysburg, and survived Andersonville. I have his service record and pension file from the NARA. – But after the war he pioneered his way to Colorado, where he mysteriously died at the age of 42. I am trying to locate his remains even now (memory of his resting place has been lost to the collective family consciousness) and to apply for that very same VA marker. I am hopeful my research and results will be as fortuitous as yours have been. Hi Jeff, I don’t know if you will read this reply but here goes. I’m from Colorado and do genealogy and if you are having a hard time finding your ancestor I might be able to help locating some records for you that you can’t get from the Internet. Let me know. Hi Joyce! I’d sure appreciate any help. It gets quite discouraging. At present, I’m trying to get a copy of the coroner’s report to see if it might give more clues as to where he might be buried, but CO State Archives sends me back to Larimer county, and the county broke up into two counties (Jackson/Larimer) shortly after he died. If you get time, please feel free to contact me at the email address below. Be looking for an email from jmceagle@aol.com okay. I live in Weld county which is east of Larimer county so it might be verily easy for me to look that report up for you. I didn’t know this. Would the Daughters of Union Veterans of the Civil War be involved, too? The group that supports the SUVCW is the ASUVCW (Auxiliary to Sons of Union Veterans of the Civil War). The answer is that not all camps have Auxiliaries that support them. So it depends. Thank you for the info – I’ll look into it! For Jeff – Mysterious – died of some kind of suspicious poisoning, according to the newspaper. There must be a story there. Since there was a coroner’s inquest, perhaps records of that still survive? Wouldn’t you like to know what was in the letter he mailed to the attorney in Grand Lake? (Colorado Historic Newspapers Collection) An item looking back to 1881 mentions he was going to take cows to start a dairy at Teller Camp in North Park. That area is so un-populated, I wonder if he was buried in a family plot. You can see a map of his homestead at the BLM General Land Office website – but that’s still a lot of ground to search. Good luck with your search for the location and records. Susan – thank-you so much for your kind words. It is nice to meet someone who understands thissituation and the many roadblocks. I am trying to figure out how to get a hold of the coroner’s report – and yes, I would love so love to see a copy of that letter. It sounds like he knew something was up. Please feel free to contact me directly if you have any interest.